I was flipping through today's paper edition of the Wall Street Journal specifically looking for the McCain article on how well he did on the MTV/MySpace debate from the other day when I stumbled across this shocking ad from these apparent shady characters at the Ballistic Rolls company which redirects to the World Reserve Monetary Exchange. Now before I hammer these people, the kind that I can't stand let me tell you why I'm so upset with the Journal. Back towards the end of our run at Harrisdirect we were running print, TV, and online ads for our new advertising campaign. Much to my chagrin, I wasn't able to prevent the print from running and got myself kicked out of a meeting or two. After I calmed down, they let me participate again just in time for the Wall Street Journal's ad editorial review to reject one of our print ads for language we used. Not that the ad was misleading, but they didn't like the use of one of our words, so we had to redo the ad. However, it was NOTHING compared with these totally misleading ads from Ballistic Rolls aka the World Reserve Monetary Exchange. 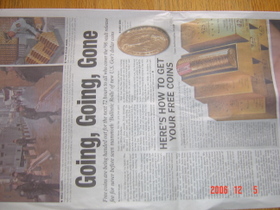 You see the Wall Street Journal let through an ad that promotes how you can get your FREE COINS! 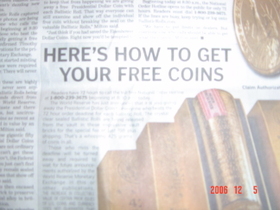 FREE COINS in nice big print so even a partially blind person could read it. However, in order to get your free counts you must cover the $98 vault release fee. Wow some free offer. I can't believe they got away with running this ad, let alone trying to promote them as government coins. Of course they have this great fine print which I typed in by hand to see how awful this "promotion" is: THE INCREASE IN COLLECTIBLE VALUE OF CERTAIN PRIOR ISSES OF U.S. COUNTS AND CURRENCY DOES NOT GUARANTEE THAT CURRENT ISSUES WILL ALSO INCREASE IN VALUE. 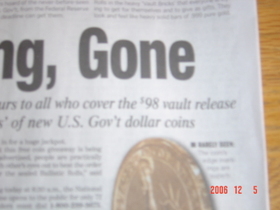 THE WORLD RESERVE MONETARY EXCHANGE IS NOT AFFILIATE WITH THE UNITED STATES GOVERNMENT OR ANY GOVERNMENT AGENCY. OH RESIDENTS PLEASE ADD SIX PERCENT SALES TAX AND SORRY NO SHIPMENTS TO MA AND VT RESIDENTS. ALL TRANSACTIONS LESS SHIPPING ARE BACKED BY THE WORLD RESERVE MONETARY EXCHANGE WITH A MONEY BACK GUARANTEE OF THE PURCHASE PRICE UP TO $10,000. As you can see from that second photo the coins are "free" so it appears to an y person that the World Reserve Monetary Exchange is giving you a money back guarantee of a "free" purchase price. I personally doubt that the $98 vault release fee would be returned. Clearly the coins are NOT FREE because you need to PAY the $98 vault release fee and then if you aren't satisfied you get nothing back in return, right? Oh, when I went to www.ballisticrolls.com and put in the claim authorization code shown in the ad SR1949 I got "The access code you have entered is invalid" and if you continue on without a code there is NO MENTION of this "offer" on their website. Isn't this the type of ad scam that should have never slipped through the WSJ's ad review process? Perhaps they got rid of that, but this kind of ad should not be in the marketplace. I wonder what the FTC would say about this? Well, it got your attention. I guess newspaper print ads can still work, at least on some level. But to be serious, isn't this just more tangible evidence that papers are desperate to get print ad dollars, to the point where they'll bend supposedly previously more stringent parameters for acceptable ads? You may have noticed the WSJ has done more and more of this sort of thing in recent years -- special ad sections promoting business investment in exotic (read: cheap) Asian or Eastern European countries, etc. This one, is far more garish than other more subtle supplements I've seen in the past. In fact, I think I've seen the same ad section in my hometown tab. All true Kate. I guess I'm still steamed that they have an ad review process and one of our HD ads got rejected but this piece of crap was allowed to run. Yes, newspapers are becoming increasingly desperate and once more folks like us infiltrate marketing ranks, we can stop spending money on this ineffective medium. One caveat, it is useful for local advertisers in their local paper, for now. I am in violent agreement with you, Eric. I have been complaining about their ads in my coin collecting blog for months, and even called them up one time to give them a piece of my mind (they were not impressed). Les - loved your blog. Good luck with your crusade - it is a righteous one. I am one gullible customer that fell for the ad and purchased online about a month ago. Never received anything at all. Sent them email inquiring and never got response. My next step is to file complaint with BBBonline. Who are these people anyway? Obviously a fraud making business of sorts. According to the comment from Lee, you can actually call them and find out, but personally I'd be worried about your purchase. I haven't personally witnessed any fraud sales, but I think you can see what I thought of their ads. Pat, let me know how you make out and if you want, feel free to email me the results of your inquiries and I'll be happy to post here. sources, keywords, locations, hits and a lot of other information also. therefore write keywords for what they are exactly looking for. Write enticing titles to pages to attract traffic. You have a very nice coins blog. You're very keen in details. My site is up already coin collecting hope you will check my coins directory site, it's nice I guarantee. i bought these about 2 hours ago. when i got home, i found this site and i called to cancel but the rep says i had to call 866-282-6587 but they were closed. i called my credit card co up to see if it has been charged..to my surprise, it has not been charged so i cancelled my card. hopefully nothing is going to go through and im going to follow up with the cancellation tomorrow morning. thanks for the info everyone. In your opinion, what's the best movie ever created? Just saw the ad in BusinessWeek. Besides nothing being free, notice the gold ingot shaped boxes the coins are packed in? They state 425 grams. Yep. That's how much these no-gold-content coins weigh. Thank you so much for this information. I was almost a victim and my intuition said check out the internet. I actually read the ad in the readers digest. You would think they would be more responsible. Its all about commercial ad money. Sad but true. Thank you for bringing this to our attention. You may have saved a lot of people a lot of grief.